Disclaimer: Due to the number of fleets involved and the utter chaos of the fight, most of the fleet figures given here are estimates only. Hakonen system, Lonetrek region. On the 23rd of October at 20:40 EVE Standard Time forces belonging to Project.Mayhem. 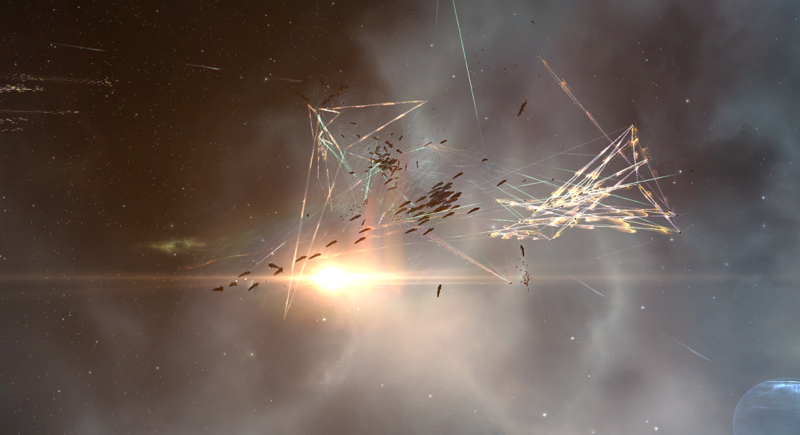 [16-13] and allies clashed with Circle-Of-Two [CO2] and its allies in the system in a sub-Capital fight that claimed 178 ships and 110 Bil ISK in damages. Project.Mayhem. once more reinforced a Circle-Of-Two tower in the system of Hakonen, and the two sides were gearing up to fight over it as it exited reinforced mode. With Circle-Of-Two being a member of the Imperium and thus having a large supply of allies, Project.Mayhem. contacted Snuffed Out [B B C], Out of Sight. [OOS] and Pandemic Legion [-10.0] for support. Project.Mayhem. and Snuffed Out organized a joint fleet of 150 pilots in Machariel Battleships with 2 Triage Archon Carriers. The fleet met in the Hakonen system on the station. Against them Circle-Of-Two organized a 150 pilot Machariel fleet of its own complete with 5 Triage Archon Carriers. The force arrived to the system before Project.Mayhem. and its allies and set up in range of the tower. Once the Snuffed Out reinforcements arrived to Hakonen and linked up with the Project.Mayhem. forces, the combined fleet warped at range of the Circle-Of-Two fleet, signaling the start of the battle. The battle was brutal from its onset, the two Machariel fleets exchanged fire at close range with auto-cannons shredding hulls on both sides. However it soon became apparent that Circle-Of-Two was very much on the losing side as it traded 5-6 Machariels for each of the allied fleets’ support and mainline ships. Project.Mayhem. and Snuffed Out did bring 2 more Triage Carriers as the fighting intensified. As the two fleets continued to brawl each other, allies for both sides started to arrive to the system. A The Bastion [BASTN] Proteus Strategic Cruiser fleet entered the fray, joining the close range brawl as well as a Get Off My Lawn [LAWN] Zealot Heavy Assault Cruiser fleet and a RAZOR Alliance Cerberus Heavy Assault Cruiser fleet. These two fleets maintained their distance from the main fight, adding their fire in support of the Circle-Of-Two fleet. For Project.Mayhem. reinforcements came in the form of Pandemic Legion’s 70 pilot Proteus fleet, who immediately set to work on chasing the two Imperium Heavy Assault Cruiser fleets and Out of Sight. who brought a Proteus fleet of its own as well. With the amount of fleets in the system the field quickly descended into chaos, as secondary skirmishes developed around the two Machariel fleets who continued to hammer at each other. At this point Shadow Cartel [SHDWC]’s own Machariel fleet entered the system. Shadow Cartel had noticed that Snuffed Out formed and took out a fleet. While scouts attempted to locate it, Shadow Cartel formed a 65 pilot fleet of its own. Unable to find the Snuffed Out forces, Shadow Cartel contacted Circle-Of-Two, as its Fleet Commanders were certain something was happening in the North. Circle-Of-Two were willing to give information only on the basis that Shadow Cartel forces would not engage the Circle-Of-Two or its allied forces. Forced to choose between standing down and allying with Circle-Of-Two, Shadow Cartel accepted the deal and were given the location of the fight. Arriving while the battle was in full swing, Shadow Cartel attempted to engage the Snuffed Out forces as well as Pandemic Legion, adding its considerable artillery barrages into the mix. With the Shadow Cartel forces joining the engagement on Circle-Of-Two’s side, the balance of power shifted towards the latter. Pandemic Legion was the first to be knocked out, as the Shadow Cartel Machariels simply obliterated its Logistics Cruisers. After disengaging and entering the grid once more, Pandemic Legion forces managed to smash the RAZOR Alliance Cerberus fleet, only to be once again targeted by Shadow Cartel’s Machariels. Unable to tank the incoming fire, Pandemic Legion forces quickly retreated, leaving the system. By this point both sides managed to lose their Triage Carrier support, overwhelmed by the massive amount of damage each fleet pumped out. However with the Project.Mayhem. and Snuffed Out Triage support gone and the Shadow Cartel reinforcements on the field, losses started mounting for the joint fleet. With their allies withdrawing and the amount of hostiles in the system only increasing, the decision to withdraw came naturally rather than risk the fleet’s total destruction. Thus Project.Mayhem. and Snuffed Out conceded the field, allowing Circle-Of-Two to secure the tower. Once Circle-Of-Two won control of the battlefield, it brought in a Titan to bridge the Shadow Cartel force home as other Imperium entities made their way back to their staging systems. Both Pandemic Legion and Out of Sight. managed to extract safely as well. The Circle-Of-Two fleet remained in the system, guarding the tower as Chimera Carriers worked to restore the tower’s shields to full. With Circle-Of-Two’s allies gone, it was the moment Project.Mayhem. was waiting for. It reformed its Machariel fleet, reaching 80 pilots, before jumping back into the system and warping at range of the Circle-Of-Two’s fleet, which at this point was estimated at 120 pilots. A second engagement flared up as the two sides once more exchanged close range fire. However, without the intervention of other parties or Triage Carriers present, the Circle-Of-Two fleet quite decidedly broke, managing to snag only 2 of Project.Mayhem.’s mainline ships before being completely overwhelmed. Losing ships in rapid succession, Circle-Of-Two’s Fleet Commanders had no choice but to sound the retreat, allowing Project.Mayhem. to secure the field. Project.Mayhem. reinforced the tower once more before finally extracting safely from the system, bringing an end to the fighting. Battle report for the first engagement in the Hakonen system can be found here. Battle report for the second engagement in the Hakonen system can be found here. All told the battle on its two parts lasted 40 minutes in total with local spiking in the first engagement and reaching nearly 700 pilots with Time Dilation playing a factor and swaying back and forth between 30% to 60%. Project.Mayhem. and its allies lost 4 Carriers, 10 Battleships and 8 Strategic Cruisers. Including support ships total losses reached 39 ships for 42.45 Bil ISK damages. Circle-Of-Two and its allies lost 5 Carriers, 64 Battleships, 14 Strategic Cruisers and 14 Heavy Assault Cruisers. Including support ships total losses added up to 139 ships and 66.68 Bil ISK damages. PL one of the last to show up and the first to run away…. Go in without much risk, get out when losing ships. pl lost like 2 oneis then repositioned. hardly counts as having your logistic chain demolished and getting knocked out ._. Leave a Reply to Archon Click here to cancel reply.